William Morrow Paperbacks, 9780062281272, 720pp. France, 1942. While war blazes at the front lines of Europe, in the walled southern city of Carcassonne, nestled deep in the Pyrenees, a group of courageous women is engaged in an equally lethal battle. Like their ancestors who fought northern invaders seven hundred years before, these members of the French Resistance—code-named Citadel—fight to liberate their home from the Nazis. Led by a daring eighteen-year-old, Sandrine Vidal, and her elder sister, Marianne, the women of Citadel work quickly to sabotage their German occupiers, safeguard their neighbors, and smuggle refugees over the mountains into neutral territory. But that is only part of their mission. Their struggle will reveal an older, darker combat being fought in the shadows, one meant to protect an ancient secret that in the wrong hands could change the course of history. As the women of Citadel dare the impossible to save their homeland . . . the astonishing secrets buried in time are at long last revealed. 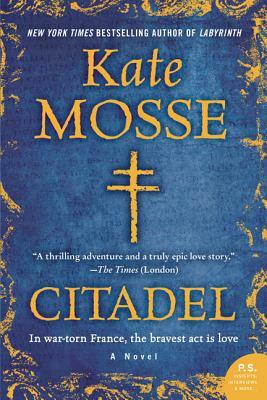 Kate Mosse is the author of the international mega-bestsellers Labyrinth, Citadel, and Sepulchre, with sales of more than five million copies in forty-two languages. A publisher for many years, she is also cofounder and chair of the board of the prestigious Bailey’s Women’s Prize for Fiction (formerly the Orange Prize). She lives in Sussex, England.